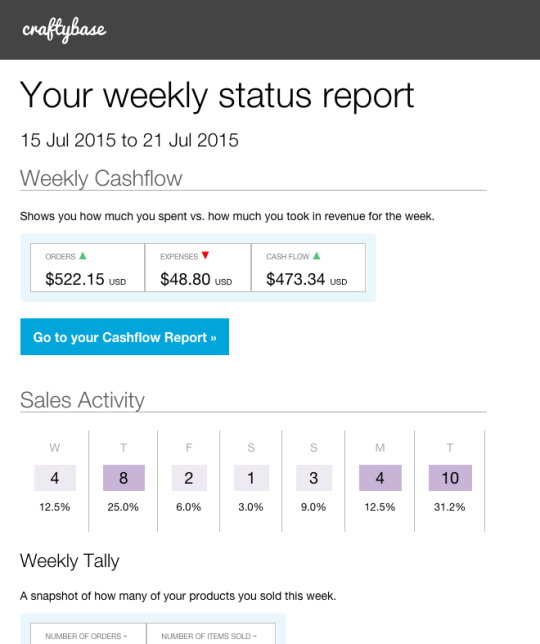 Last week we began sending out weekly summary report of your activity on Craftybase. This report shows you your total cashflow for the previous week, sales activity trends (including your most popular products) and total manufacturing costs. Your activity is always compared to the week before, so keep an eye out for the little trend arrows next to each section to see if you are “up or down” from the last week. If you don’t wish to receive this weekly report, just click the “unsubscribe” link at the bottom of the email and your settings will be updated instantly. Haven’t received your weekly report yet? Let us know and we’ll investigate this asap for you.